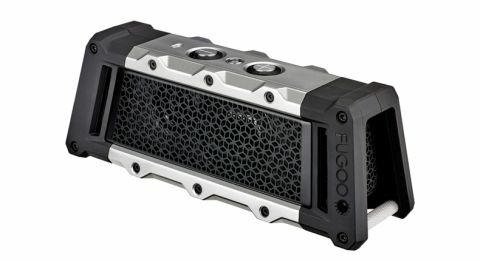 Fugoo Tough review | What Hi-Fi? Overall sound is decent, if you can get over the harsh treble. But it feels as if Fugoo has spent too much time making the Tough… tough. Three, two, one. Activate! If you understand that reference, you obviously watched Robot Wars. For those who didn't get it, this was a television programme in which the Fugoo Tough could easily have been a contestant. Though missing some wheels, a blowtorch and circular saw, the Tough might have been a match for Sir Killalot. It's waterproof, mudproof (yes, that is a thing), shockproof and claims to go for 40 hours. “Barriers are meant to be broken, your Bluetooth speaker isn't,” says Fugoo. They even suggest strapping it to a tree or tacking it onto your harness for a more tuneful abseil, after all, why shouldn't go-anywhere actually mean ‘anywhere’? There are six drivers here: a tweeter and bass/mid-range driver front and back, and a passive bass radiator at each end. The intended result is 360-degree sound – pretty important if it's going to be heaved around – with a frequency range belying its diminutive stature. Aptly, perhaps, we kick off with the colossal psychedelia of Tame Impala's Elephant. Given its ultra-active target market, we probably shouldn't be surprised by the liveliness of the sound. The Tough positively struts through the offbeat rhythm changes, affording plenty of energy while not losing sight of that laid-back Australian cool. You can hear those bass radiators working on the chugging guitars, and, sure enough, the sound remains coherent as we throw the speaker around. But there's an issue with the treble. At the start it sticks out as a bit harsh, but as it goes on our ears begin to ring. Higher up the frequency range, percussion sounds lightweight, detaching it from kick drums and toms (which have a decent amount of weight) to send the whole rhythm section a little off kilter. There’s a similar lack of solidity to vocals that reduces the believability in a range of voices from Leonard Cohen on In My Secret Life to Karen O in Yeah Yeah Yeahs' Gold Lion. Even if the treble weren't so coarse, that would definitely remove an element of satisfaction from listening to the Tough. Of course, the thinner the original recording, or the less composed it is in the treble, the more difficult it becomes to listen to on a speaker over-cooking the top end. Unfortunately, it undoes much of what's good about the speaker. Fugoo has got a lot right here. In terms of robustness, there really isn't anything else on the market at this price that can compete. The sound isn't entirely offputting either; it's rhythmic, there's a decent amount of bass weight and reasonable amount of detail. We just think you'd be better off buying something that isn’t quite as tiring to listen to over long periods, and caring for it better than you would with the Tough. After all, sound is surely what matters in the end.